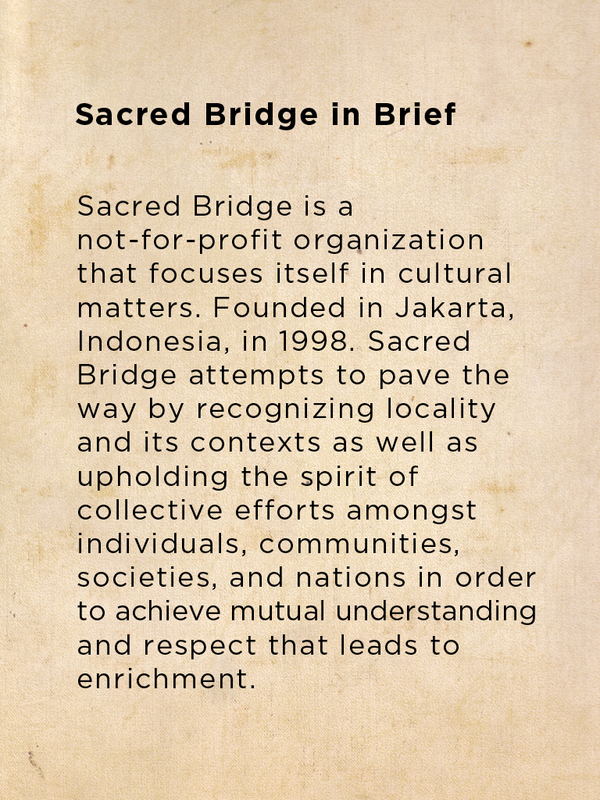 [Jakarta, LTTW] January 13, 2019, our parent organization, Sacred Bridge, is reborn. 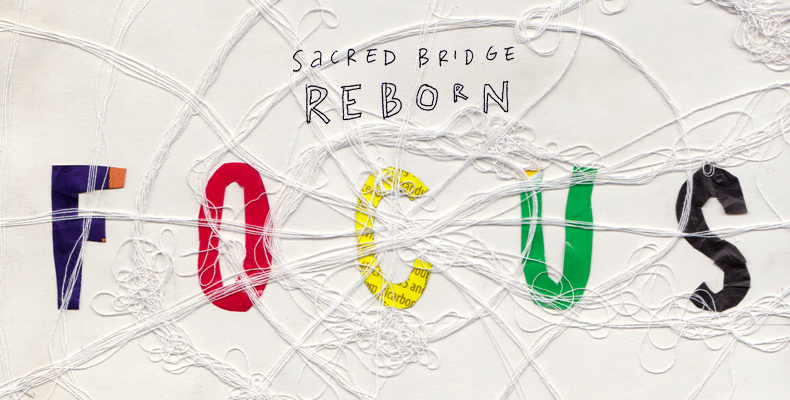 In the eyes of Sacred Bridge, “reborn” is not merely rebirth, but also rethinking and revisiting its fundamental values based on guidance of the past and present life to re-establish (including re-evaluate) the foundation towards the future. 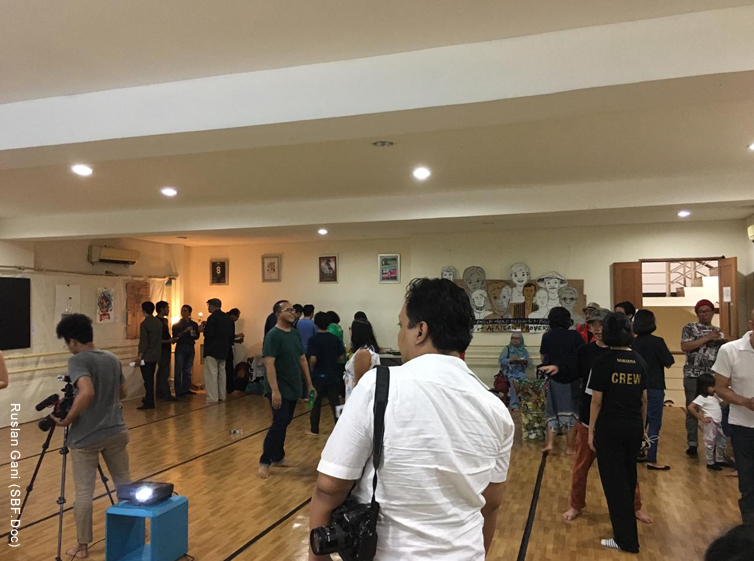 One of the Sacred Bridge founders, Serrano G. Sianturi (1960-2019) mentions, “changes can only happen on the ground,” captures the very spirit of Sacred Bridge “Reborn”. This will manifest in its plan to return to fieldwork, as the foundation used to do. This New Year “celebration” was delivered through a warm and humble event where inclusivity is prioritized and art is highlighted. Such celebration meant to re-introduce what Sacred Bridge is all about, to share the foundation’s future agenda, and to encourage the guests to focus on recognizing their roles and functions in society in order to tackle issues that matter today. Comprised of three sections (Introduction, Theme, and Variations) the event was inspired by the classical form, preceded by the speech of Ginastera “Boo-boo” Sianturi, the acting chairman, on the foundation and its regeneration; restructure of the foundation boards, followed by a video recollection of Sacred Bridge programs (from 1998 to 2018) and forewords from the founders; Stephen Hill, Philippe Delanghe and I Nyoman Astita. The second section, “Theme”, was marked with a live music presentation of “Gondang Pangharoanan”, a ritual “music” of Parmalim, followers of Malim religion (a native religion of Batak Toba, an ethnic group in North Sumatra) to mark the beginning of Si Paha Sada (first month of the New Year). As the music playing, the seed-sowing ritual was performed. While the Parmalim is sowing seeds, Sacred Bridge is sowing collective mind and heart. 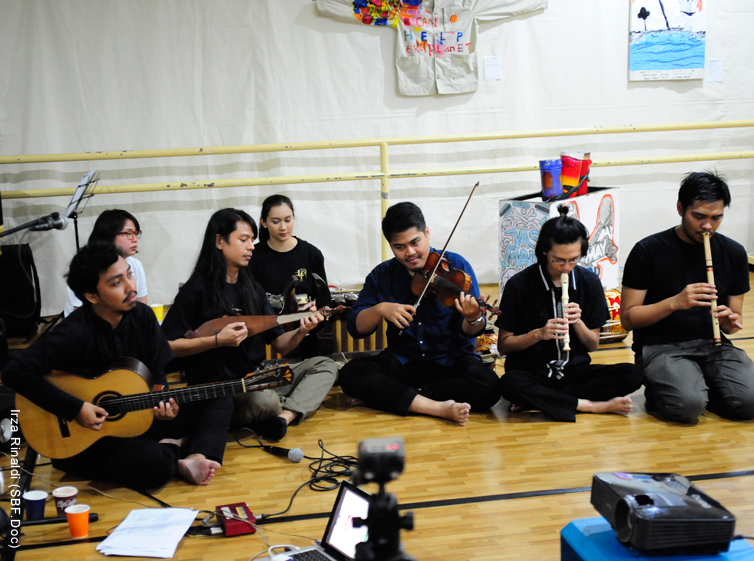 “Gondang Pangharoanan” | Arranged collectively by musicians: Boo-boo Sianturi, Teodore I. Minaroy, Arie Irvan Harjakusumah, Mirza Elba Febrian, Erlangga Utama, Pradiva Sawarno, Irninta Dwitika | Photographed by Irza Rinaldi. 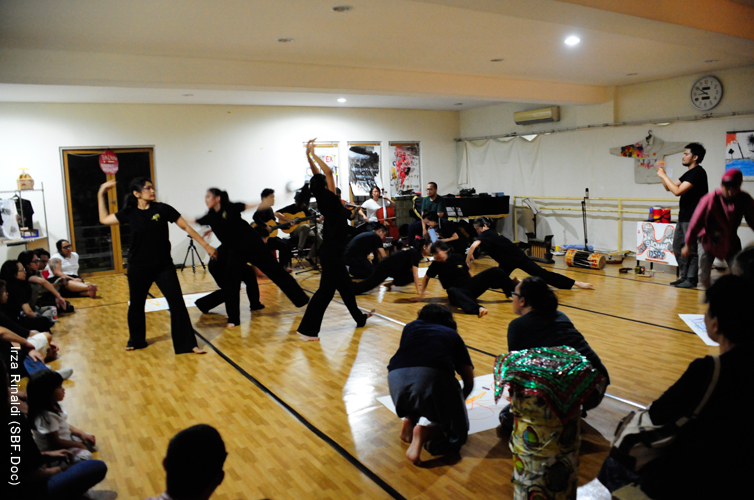 The above musical presentation is an attempt to interpret the original Gondang Pangharoanan in many respects. Performed by urban musicians who live distantly from nature, the value of ritual music and culture of Parmalim should be recognized. It portrays a living example of local culture that still manifests and safeguards the important relationships between human, nature, and deity, which modern men have ignored for a long time. Nearly 20 years since the 21st century passed by, the advancement of human civilization is rapidly developing, while the real solutions of the world’s problems are yet to be resolved. Those problems often were answered only by technological innovations, politics and/or economy alone without giving a chance for a culture – including community involvement – to take the lead. Instead of a solution, it creates more complicated problems and causes confusions. 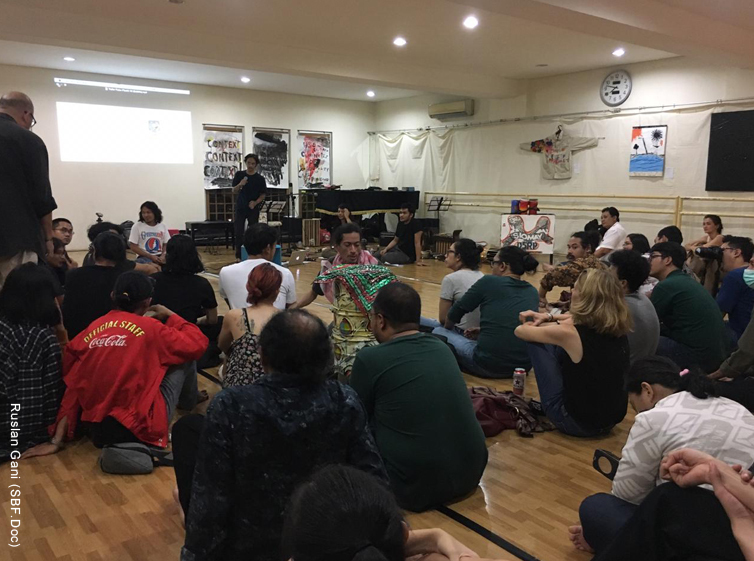 In the discussion session, the Sacred Bridge delivered a brief presentation of a sub-theme of the event, FOCUS, to encourage the guests to focus on their roles and functions within their community and society to preserve their environment. Environment for Sacred Bridge is a “home”; an identity (locality) and a natural mechanism of interconnectivity between human and its surroundings; other humans, animals, vegetation, gases, sounds, lights, visual, and even void. 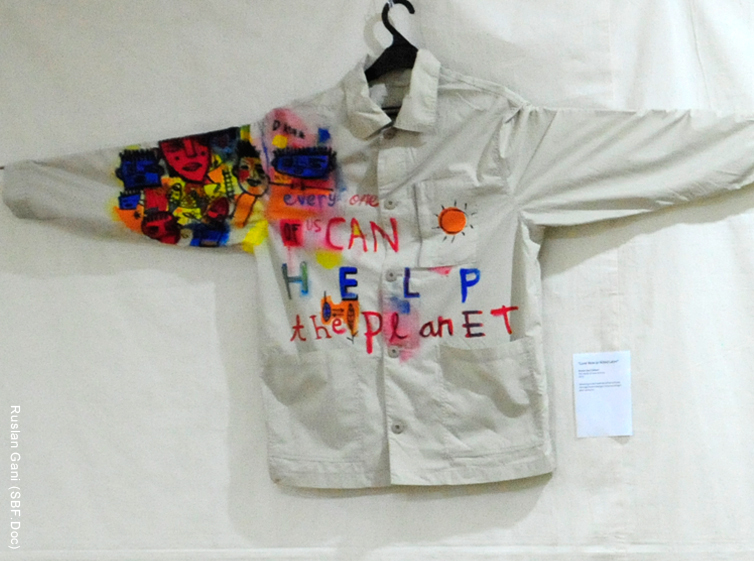 This event served as the representation of the environment. It only happens because there is interconnectivity between role and function, host and attendance, sharing and listening, active and passive and many more. The presentation also functioned as discussion point of departure that later occurred in the last section. 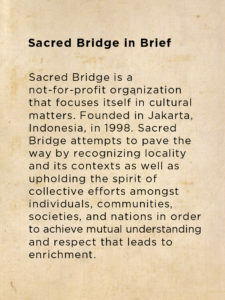 In the previous section, Sacred Bridge had a role to share while the guests were listening. In the peak event,“Variations”, the situation was reversed: the guests are invited to share their diverse perspectives on environment while the host was listening. The discussion flowed in healthy and engaging manner; many of us learned new things. However, some guests seemed to dominate the conversation instead of giving other participants a chance to speak their mind. 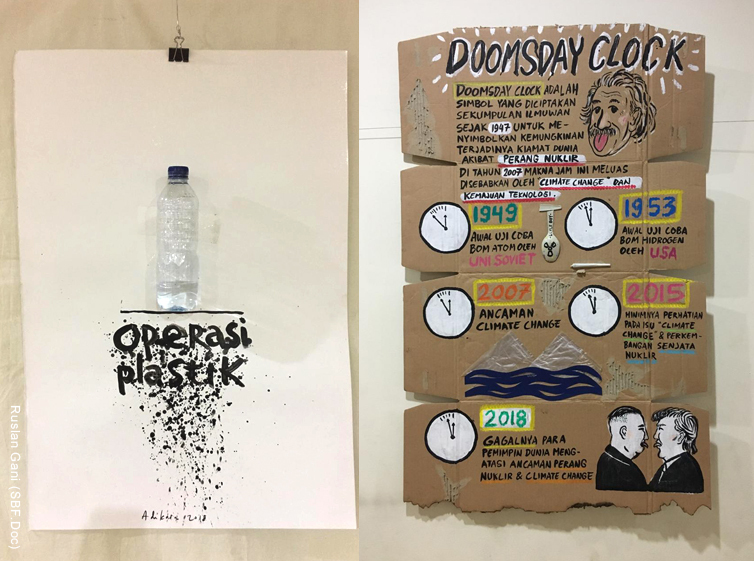 Moreover, the conversation only focused on physical environmental problems such as waste, deforestation and climate change without further discussion on human relationship. It seems that this simple exercise managed to show the real problems in our society. As a symbolical statement, Arts was chosen as a vehicle to underline the importance of “focus on doing”. In Sacred Bridge, it’s a tradition to utilize art as a medium to bridge one grid to another. 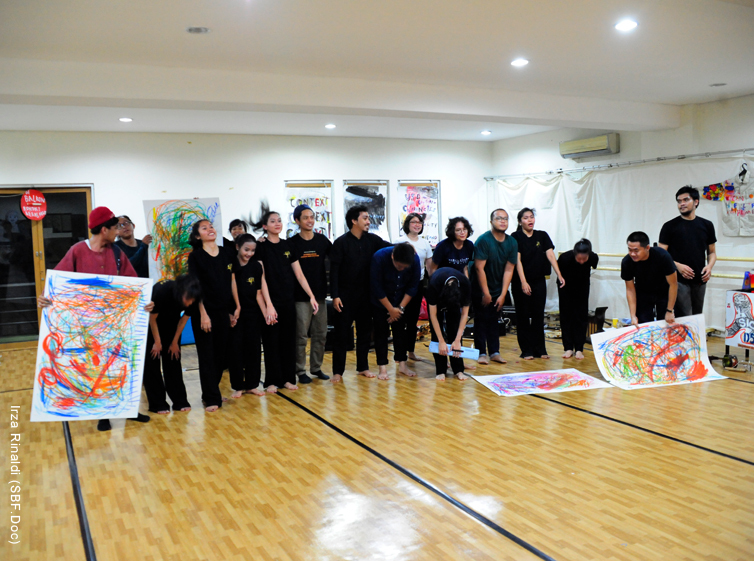 The foundation believes that arts possess important roles and function to shape society. Not only is it a form of freedom of expression, but it also has the ability to move and unite people. 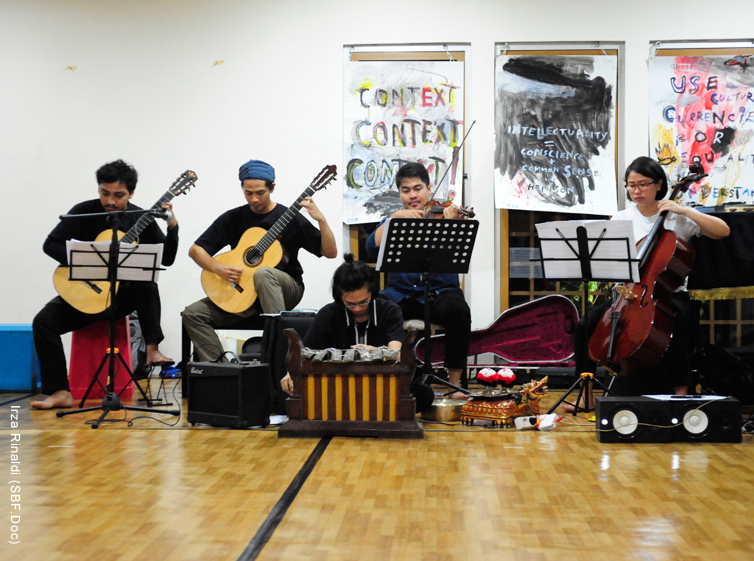 Thus, series of arts performances as part of variations was set to become the finale of the event. Art Exhibition of Fades art & design community, “Multi-perspectives” provide us with many perspectives in facing our environmental problems – both tangible and intangible | Artists: Ruslan Gani, Maria Junia, Adikara Rachman, Reydo Respati, Syabilli, Galib Harnaen Triputra| Photographed by Ruslan Gani. 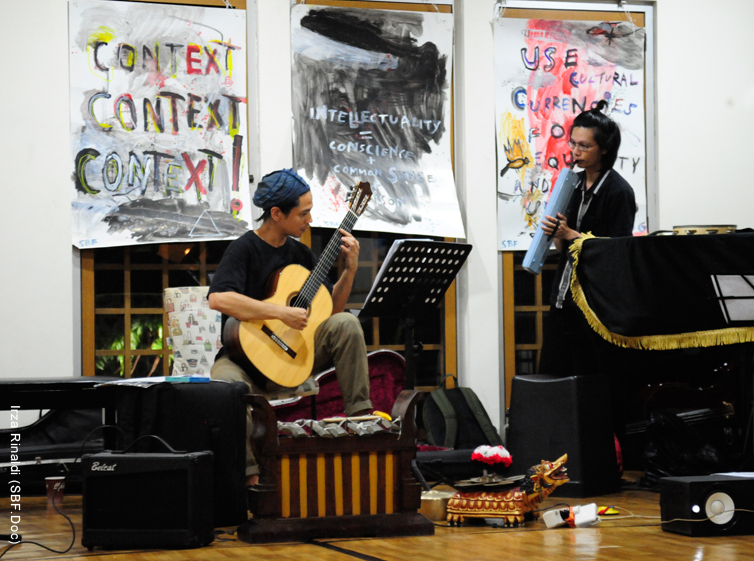 The intricacies of Balinese interlocking pattern is presented well and clearly through a Western notational form in “Kotekan”, composed by I Nyoman Astita | Musicians: Boo-boo Sianturi, Teodore I. Minaroy, Arie Irvan Harjakusumah, Mirza Elba Febrian, Pradiva Sawarno | Photographed by Irza Rinaldi. 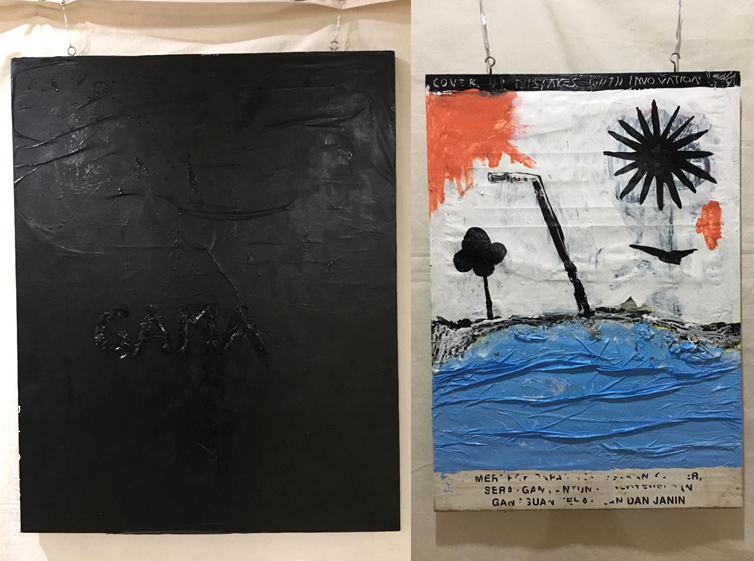 The choreography of “Energy” reflects on various fundamental manifestations of human interactions that stands in need of awareness, understanding, and mutual respect as a respond to environmental issue. 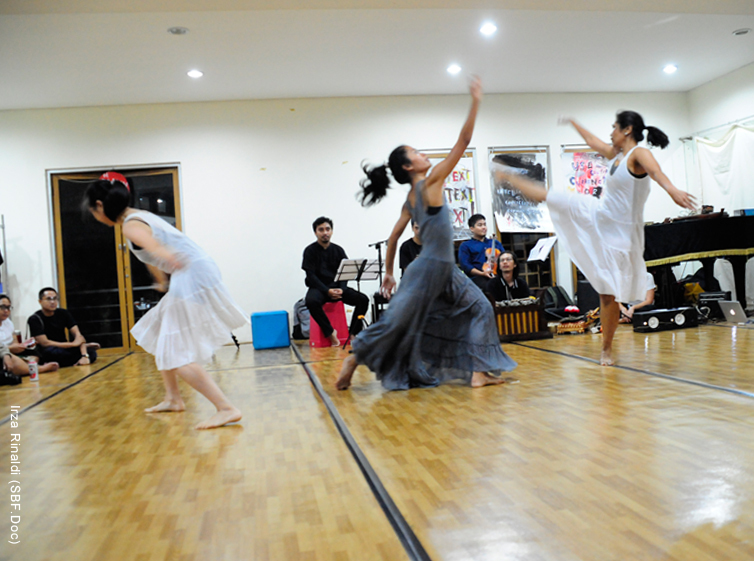 Choreographed by Andhini Rosawiranti | Dancers: Andhini Rosawiranti, Irina Putri Sudarsono, M.M Kanya Anindita | Photographed by Irza Rinaldi. The two famous folk songs from Jakarta “Kicir-Kicir” (unknown composer) and “Ondel-ondel” (composed by Djoko S.)) are arranged by Ginastera “Boo-boo” Sianturi into one repertoire “DJAKARTA” as a form of reflection on his childhood growing up in the city in which its identity keeps on diminishing | Musicians: Boo-boo Sianturi and Teodore I. Minaroy | Photographed by Irza Rinaldi. 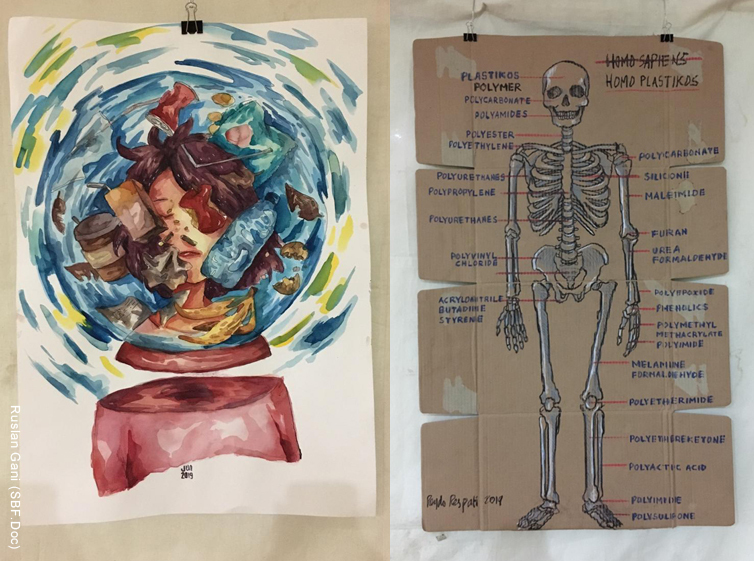 Collaborative arts performances where artists from three different disciplines (music, dance, and visual) gather to create collectively as means to respond to the environmental issue. 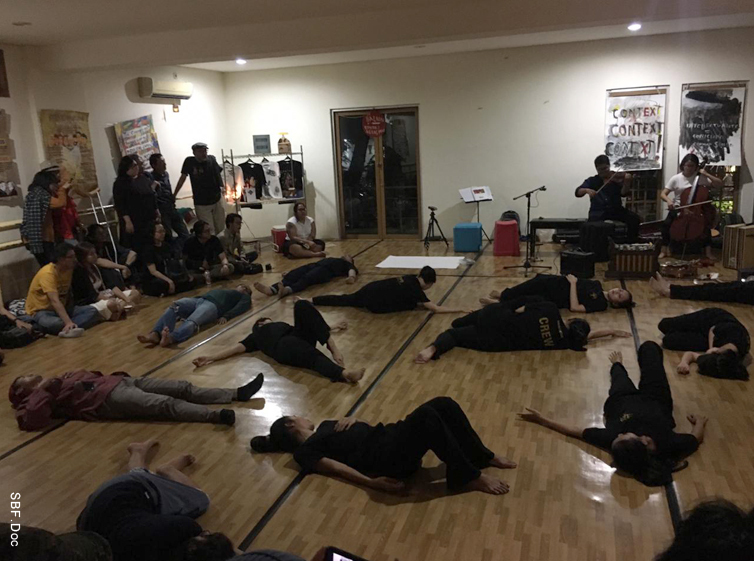 The “INTRA-ART” performance is a symbolic representation and a collective effort with the aim to establish and to nurture a Community of Practice | The team: Musician (Boo-boo Sianturi, Teodore I. Minaroy, Arie Irvan Harjakusumah, Mirza Elba Febrian, Erlangga Utama, Tri Yuniharto Wijoyono Sigit, Pradiva Sawarno), Dancer (Irninta Dwitika, Tri Prasetyaningtyas, Andhini Rosawiranti, Irina Putri Sudarsono, M.M Kanya Anindita, Soraya Nathasya, Saskia Anindita Utomo), Visual (Peter William, Ruslan Gani, Maria Junia, Gesa Febrian) | Photographed by Irza Rinaldi.